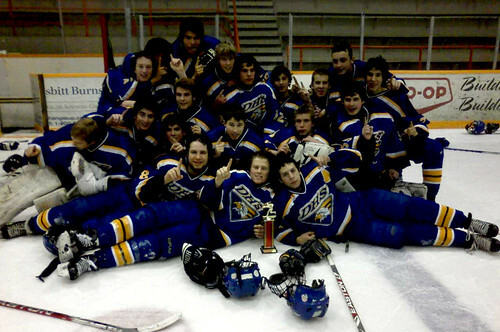 The DHS Eagles Boys Hockey team are the “A” side champions in Winkler, MB this weekend. The boys played strong games on Friday which moved them into the “A” side semifinals on Saturday. Game two ended with DHS over Pointe des Chenes 4-3. Daimon Wesley had 2 goals, Jake Berrey and Blair Dingwall had one each. Zack Lake took the win in net. On Saturday, the boys took game 3 with a score of 5-2 over Stonewall. Goal scorers were Ryan Lobreau, Zack Pitchenese, Grant Valiquette, Matt Bartlett and Jared Stratford. Kim Wildhaber was in net for the win. Dryden met Kenora in the “A” side finals at 7pm on Saturday. DHS took this game, with a final score of 4 to 1. Goal scorers were Ryan Lobreau, Jared Straqtford, Grant Valiquette, and Josh Reid. Goaltender Zach Lake took the win in net. Next action for DHS boys is a home game this Tues Jan 12. Puck drop is @ 6:30 p.m.
Come out and cheer on your Eagles Hockey Team!